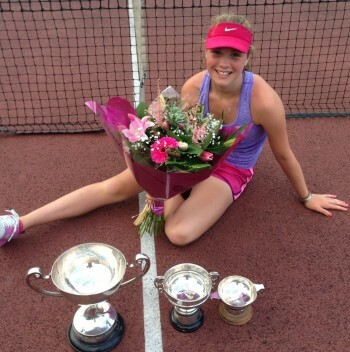 Talented tennis player Grace Eland is making huge strides on court while continuing to study hard at Penrith’s Queen Elizabeth Grammar School. Grace received support from the Cumberland Educational Foundation and Cumbria Young People’s Fund towards tennis training and expenses. Grace is the daughter of Lynsey and Errol Eland, and Lynsey said: “Grace manages school work, training and competing, which is unusual. At the nationals she attended, most of her opponents are no longer in mainstream school, but are training full-time at tennis academies. “In the latest tournaments, Grace won the national Doubles title for the first time with her partner from Cheshire, this has helped cement Grace’s position currently as No.5 on the national summer leader board. This is a fantastic achievement for Grace, her club and team in doing this when competing with 90% of the top 30 in the country are not in mainstream education. Also winning the national title, makes Grace the first female junior to do so from Cumbria. “Grace has claimed another U18 title in Edinburgh in June at the age of 13, where previous winners of this tournament have been Judy Murray, who claimed this 3 times. Grace feels she’s on track to beat that! Grace began playing tennis at the Chatsworth club in Carlisle when she was six. She also plays weekly with Kirkby Stephen Grammar School community sports officer and tennis coach Gary Payton, and attends the high performance centre in Newcastle twice a week.